Fear of the number thirteen? Paraskevidekatriaphobia is the fear of Friday the 13th. It is closely associated with triskaidekaphobia, but it is believed more people suffer from it. There is no reference suggesting that Friday the 13th was considered unlucky before the 19th century. In 1307, on Friday, October 13th, Philip IV, King Philip IV of France ordered the arrest of the Grand Master of the Knights Templar as well as other members of the templars. They were later tortured and executed, but there is no reference suggesting that this event has anything to do with how ill-fated Friday the 13th is considered. The first reference appeared in a biography of composer Gioachino Rossini (published in 1869) who considered 13 an unlucky number and Friday an unlucky day. Eventually he died on 13th November 1868. But not even in the lengthy 1898 edition of “Dictionary of Phrase and Fable” written by E. Cobham Brewer, Friday the 13th does not appear as a superstition (although both Friday and the number 13 are mentioned). We can conclude that the fear of Friday the 13th is a newer one who developed extensively in the 20th century, partly helped by popular culture. 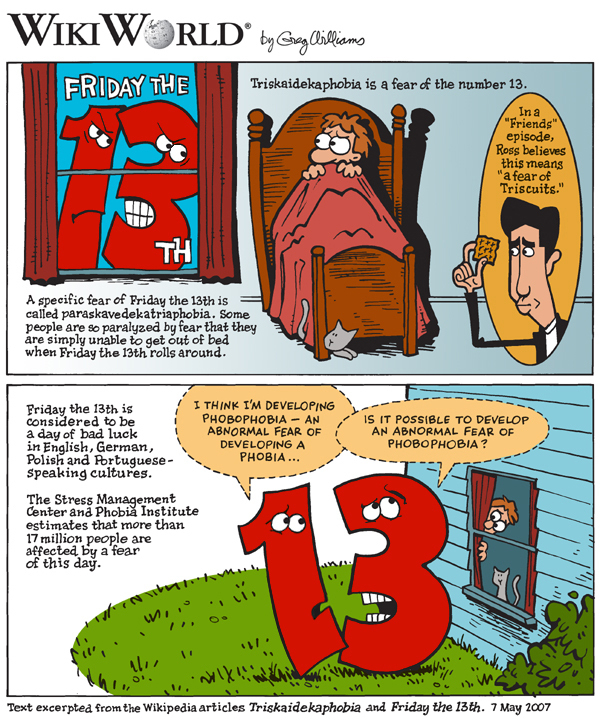 Treatment for paraskevidekatriaphobia is no different than the treatment from triskaidekaphobia. A person needs to be exposed to his phobia gradually.